A stunt driver who moonlights as a wheelman makes a decision to help a family in over their heads with the wrong people. Once the decision is made however, there is no going back and the driver must risk his own life to save theirs. There are plenty of movies that are set in Los Angeles but very few of them know how to truly utilize the city. Director Nicolas Winding Refn and cinematographer Newton Thomas Sigel were able to capture the metropolitan cityscape in a fashion that highlights the beauty of the city as well as exposes its seedy underbelly. Take the opening sequence for example; the audience is introduced to the unnamed main character, Driver, as he drives for two small time crooks trying to pull off a breaking and entering job. During the escape, the Driver weaves through the downtown streets trying to avoid and evade the police. Throughout this sequence Nicolas Winding Refn made a bold decision to keep the camera inside the car only showing the audience the line of sight that the Driver himself is seeing. This gave the audience a real sense of driving throughout downtown Los Angeles that I haven’t seen executed as well in quite a few years. Not only does the film do an immaculate job of capturing and visualizing Los Angeles, but it also uses the locations as integral parts of the story. Hossein Amini’s script makes a point to not only identify street names and local hotspots including Staples Center, Echo Park and the Hollywood Bowl but make them part of the development. 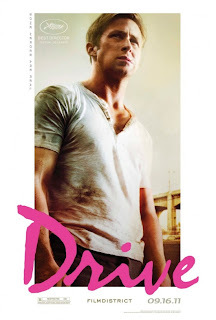 “Drive” is a callback to heroism and values that seem to have been lost in the twentieth century. The film has a clear fairy tale sensibility to it, though I found the thriller to feel more like a modern western set in downtown Los Angeles. The audience is introduced to a stoic and heroic central character that might as well be an outlaw of the old west. A character that goes the entire movie unnamed and never reveals his backstory. A sound or educated mind may question this unnamed outlaw’s judgment, to blindly help a family in need but to the Driver, this is only action to take. While it may not be the best decision, he is willing to help this family at all costs, because he deems this as just. Simply put, the Driver is willing to risk his life in order to ensure the safety of others. One aspect audiences will certainly notice in “Drive” is the deliberate pace and tone director Nicolas Winding Refn chose. This pace may feel unusual to casual movie audiences at first, but they should settle in to the flow that isn’t afraid to slow things down and allow them to develop. Scenes brave enough to let the actors to do the lifting, versus over-editing or multiple camera angles to manipulate the flow of the sequences and story. There is a tremendous build that Refn’s drama displays as well as a slight unnerving tone that never allows the audience to take a breath of relief. I should note, there is plenty of editing and sound design that really helps to magnify this film’s heroic tale. It is just not overused. One exchange in particular, between the Driver and Bernie Rose (Albert Brooks) a Mafioso who the Driver must confront, is masterly edited by Matthew Newman. Newman takes the audience back and forth between a face-to-face meeting and trip that tests both of men’s core values. This is another scene that proudly calls back to unabashed heroism that has since seemed to vanish from today’s modern society. Helping to submerse the viewer in “Drive” is an addictive soundtrack and original score. Nicolas Winding Refn did a fantastic job tracking down selected tracks from artists such as Desire, The Chromatics, Kavinsky & Lovefoxxx, and College. These artists and their tracks add an obsessive factor to the film that viewers will walk away hooked on. Not only that but, the singles within the soundtrack also help give the viewer background knowledge and character development to our main characters. “Under Your Spell” by Desire is a perfect example of this. Refn takes the audience between two adjacent apartments while the single plays. The single adds compelling background music but it is also eluding to the characters shared feelings. Another single that helps to develop the story Nicolas Winding Refn is telling is “A Real Hero” by College featuring Electric Youth. This track plays twice in the 100 minute drama and each time it hammers home the heroic symbolism Refn is so brilliantly displaying throughout the film. Cliff Martinez’s original score is another piece that really helps to establish the deliberate tone and pace Refn is striving for. The cast of “Drive” is gripping. Ryan Gosling personifies the stoic heroism director Nicolas Winding Refn is driving at with precision. Gosling drips confidence as the Driver. His character feels from a different generation. To use a gross idiom, Gosling is a man’s man as the Driver. Unfortunately Carey Mulligan’s character Irene is nothing more than an object of desire. Mulligan is adorable as Irene and her performance works in the parameters of the character but I’d be lying if I said I wasn’t a little disappointed we have another female role where she is just there to look pretty and represent a woman in need of help. There’s an argument that Irene is fashioned as a princess in search of her prince charming however, that notion is never really developed and instead glazed over. Her character reminds me of so many stereotypical female roles seen in westerns and I hoped to see a bit more depth. Bryan Cranston and Albert Brooks both deliver strong performances in their perspective roles adding some pivotal character development to a story that on the surface is fairly straight forward but behind the framework lies some highly detailed background. "Drive" represents a new western set in modern Los Angeles. The drama takes risks that pay off time and time again like little exchanges between Irene and the Driver where no words are said yet all the emotions are conveyed. There is a crazy balance in "Drive" that is steady and reserved but peppered with brutality and volatile eruption. It feels like Nicolas Winding Refn wanted to make a throwback that paid homage to the thrillers and muscle car movies of the 1970's while it also comes across as a slap in the face to the conventional blockbuster action movie. It plays off stereotypes we see repeatedly and it could have very easily came across cliched and trite but instead it is handled with precision, care, and attention. "Drive" is a breath of fresh air and reminds us that not all of our heroes have to have a name or even a backstory to leave a lasting effect.